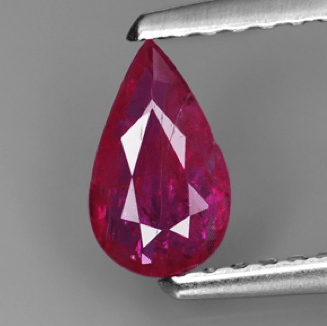 Rare and beautiful natural ruby from Mozambique, untreated and not heated, this gemstone has a purplish red color very intense and really attractive, come in a pear shape faceted cut and presents some visible inclusions that does not ruin its beauty. This Ruby is completely natural! Dimensions: 6.9 X 4.1 X 1.7 mm.